Sussex and England wicketkeeper Matt Prior struck the first century of the County Championship season against Middlesex on day three at Hove. Prior, 32, who was dropped by England for the final two Tests of the 5-0 Ashes whitewash in Australia, made 125. He eventually fell to Steven Finn, who also returned from a poor winter with impressive figures of 6-80. Sussex were all out for 386 shortly after tea, Middlesex replying with 57-1 by the close, still 224 behind. Prior's innings, which included 19 fours and one six, accounting for 82 of his 125 runs, came off 138 deliveries. The Johannesburg-born wicketkeeper has scored seven centuries in 75 Tests for England, the last of which came against New Zealand in Auckland just over a year ago. He was displaced by Yorkshire's Jonny Bairstow for the final two Ashes Tests in Australia, having averaged only 17.83 with the bat in the first three matches. Finn has not played Test cricket since the first match of England's home Ashes series against Australia at Nottingham last summer. But the 25-year-old did his chances of a recall no harm at Hove, taking six of the seven Sussex wickets to fall on the third day. Having resumed on 86-3, after day two was lost entirely to rain, the hosts scored at a healthy rate throughout, James Anyon (50), Ben Brown (44) and Matt Machan (38) all providing decent contributions. But the Sussex innings came to an end soon after a delayed tea interval just 14 runs short of a fifth batting point, with Jon Lewis (35) the last man to fall, run out by Toby Roland-Jones. Middlesex lost Sam Robson cheaply within the first five overs of their reply, but Australia Test opener Chris Rogers (27 not out) and Dawid Malan (21 not out) guided them through to the close. 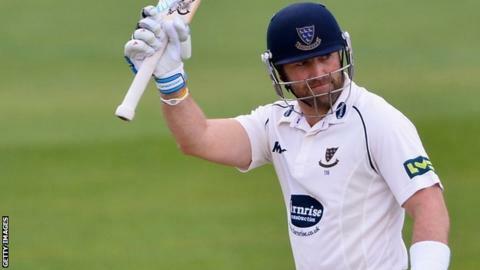 "Matt Prior staked his claim for an England recall with a typically aggressive innings of 125 - his first County Championship hundred since 2010. "After a disappointing 2013, Prior was back to his very best and, despite being dropped on three occasions, his innings was full of shots of the highest quality all around the wicket. "The Sussex middle and late order then pressed home the advantage, Anyon, Brown and Machan all making solid contributions as the last seven Sussex wickets added 344. "However, with the wicket playing well, Sussex will need to work hard to take the nine further wickets they need, and the left-arm spin of Ashar Zaidi may still have an important part to play." "Middlesex have it all to do to save the game on the final day after Sussex dominated again. Matt Prior's century was the highlight of a strong performance with the bat by the hosts. "Steven Finn's six wickets were perhaps overshadowed by the size of the deficit at the close of both first innings, but was nonetheless a boost for his England aspirations. "The pitch started to show more signs of inconsistent bounce, which is only likely to increase as an early season pitch dries further on the final day. "Middlesex navigated their way through the 19 overs they had to face at the end in admirable fashion but, even with nine wickets standing, their task is tough on the final day against the hosts, who should be in good spirits."